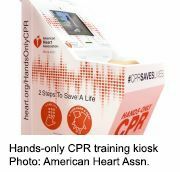 TUESDAY, Nov. 27, 2018 (HealthDay News) -- Hands-only CPR training kiosks in public places are an effective way to teach this lifesaving skill, a new study shows. "These kiosks have the potential to lower barriers to training, increase the likelihood a bystander would perform CPR and positively impact the likelihood of survival from cardiac arrest outside of a hospital," said study author Debra Heard. She is a consultant with the American Heart Association (AHA). Such kiosks are available in 16 airports and 14 other public areas in the United States, and more than 100,000 people have received CPR training at them. Bystander CPR significantly improves the chances of survival for people who suffer a cardiac arrest outside of a hospital. Hands-only CPR also eliminates concerns about mouth-to-mouth contact, the researchers noted. Their study of 738 people compared three types of hands-only CPR training: a classroom session with a facilitator; a free kiosk session with a mannequin; or a video-only session. CPR ability was similar among participants who did the four-minute kiosk session with practice and feedback, and those who did a 30-minute classroom exercise. Both groups had better CPR skills than those who only watched a video. "For a person with little or no medical training, hands-only CPR training kiosks can teach lifesaving skills in just minutes," Heard said in a news release from the American College of Emergency Physicians. In the United States, less than 46 percent of adults who suffer cardiac arrest outside of a hospital receive CPR, according to the AHA. "Public health professionals should advocate for regular classroom or kiosk training and re-training," Heard said. The study was published recently in the Annals of Emergency Medicine.